The original ‘Arabian Nights’ was a collection of folk-tales from what was Persia, and which eventually made its way to Europe. You would probably recognise some of the most famous stories, like Aladdin, Ali Baba and the Forty Thieves and the Voyages of Sinbad. 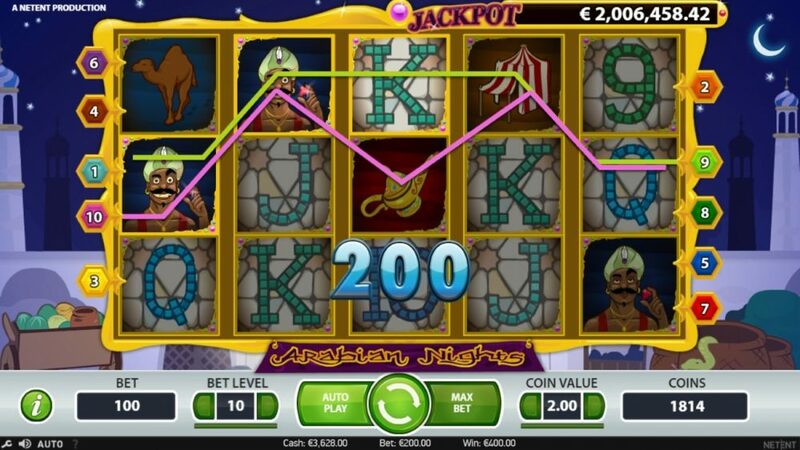 This slot game from NetEnt borrows the name and some relevant images, but most players are more interested in the progressive jackpots than the centuries old stories. 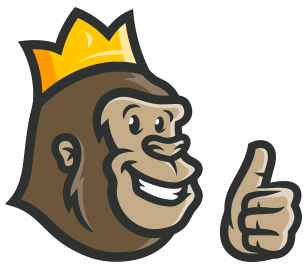 The Casino Gorilla is not the world’s greatest fan of literature, but it didn’t take much persuading for him to have a crack at some of the jackpots on offer from this game. 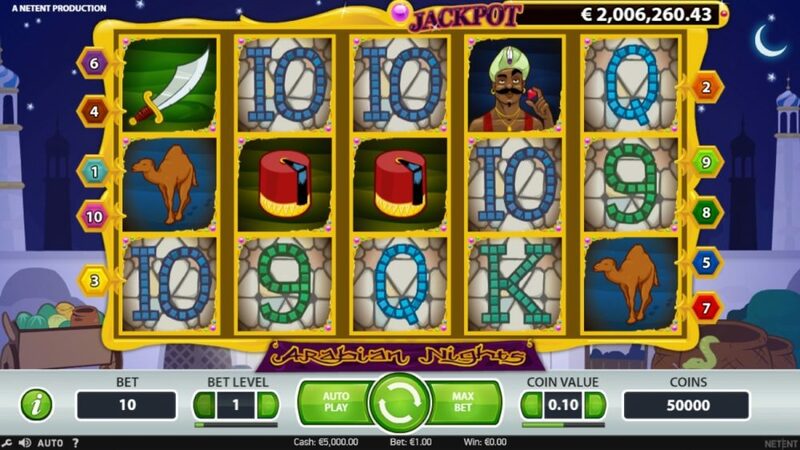 Arabian Nights is another one of those classic progressive jackpot slot games that seems to have been around forever. In fact Net Entertainment released this game in 2006, and for sure this ten pay-line game is showing its age by now. If you decide to have a go at hitting the jackpot then you can place bets ranging from 10p/c all the way up to £/€20 per spin of the reels. The top prize on offer from the base game is released if you find 5 scimitar symbols in a row: this would pay out 2,000 times your bet. We mentioned that Arabian Nights is looking a bit dated, and that is most obvious when it comes to the graphic display. The symbols to play with here all refer back to the source tales, meaning that in the base game you will find a camel, a fez, a tent, pointed Arabian-style slippers and that scimitar. Alongside these are lower value card symbols going from 9 to K. Collect three or more of the same symbol on one of the 10 pay-lines from left to right, and you pick up a cash win. 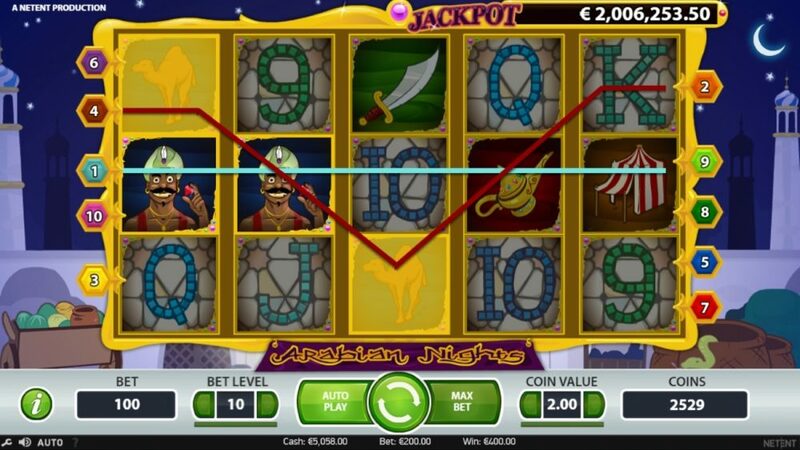 Unfortunately, all of the symbols are rather crudely drawn compared to the visually impressive graphics we are used to from modern slot games, so the game does not make a great impression at first glance. The audio experience is not a whole lot better than the visuals, but if you are playing this game for how it looks and sounds then you are definitely in the minority. The Casino Gorilla was not impressed by the appearance of this slot, but the ever-increasing jackpot total across the top of the reels certainly got his attention. Apart from the base game symbols as outlined above, there are a couple of very important symbols that you need to look out for. The first of these is the magic lamp, the one that Aladdin rubbed to release the genie and make his wishes come true. You will certainly be wishing for these scatter symbols to show up somewhere, as if you see three or more of them on screen at the same time you will unlock a free spins game. There are 15 free spins on offer and these are boosted by a 3x multiplier of anything you win during them. There are certainly a few financial wishes that could be turned into reality with that kind of pay-off. If you really want to make dreams come true then you are going to have to hope that the Arabian Night symbol appears. They usually mean good news even when one or two show up, as these are wild symbols that can replace any of the basic game symbols. What’s more, any wins featuring a wild symbol are doubled. However, if you are lucky enough to see five of these together on an active pay-line then you can really celebrate, as you have just won a jackpot which regularly extends into the millions. There is no mini-game or separate screen to complete, just find 5 Wild symbols in a winning line and your bank balance is going to look a whole lot healthier. Let’s not sugar-coat this: there is one reason to play Arabian Nights, and one reason alone: that’s the jackpot that you can see ticking over atop the reels. With graphics as dated as these, NetEnt would probably have sent this game off to the slot game graveyard in the sky, if it weren’t for the fact that it’s still so incredibly popular. 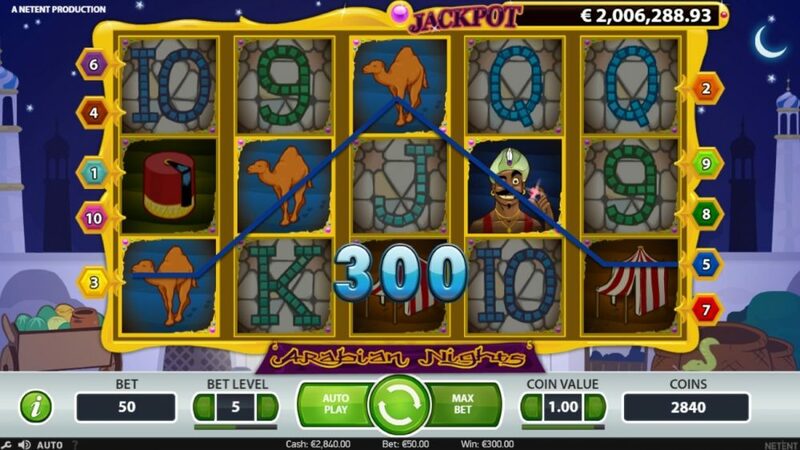 Online casinos don’t place this game on their lobby to wow players with its sleek graphics and next-gen animations. No, it’s there because players just want to see if they can unlock that enormous jackpot. 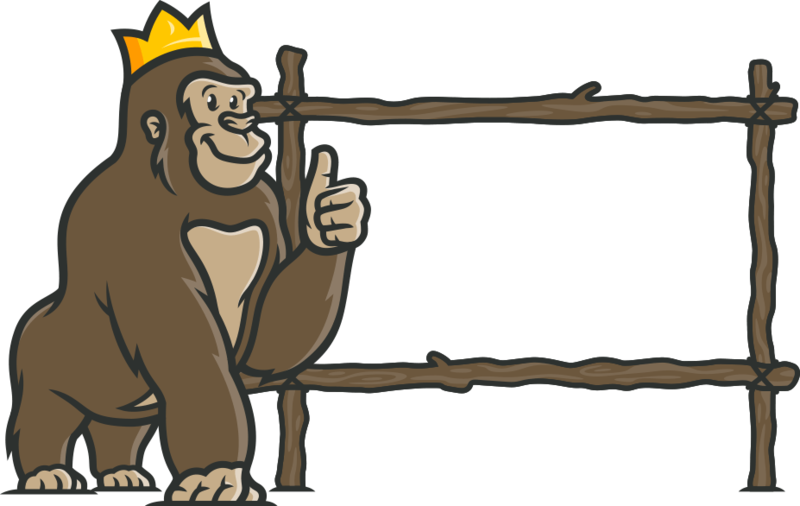 The Casino Gorilla grew pretty tired of Arabian Nights after a while – the base game is just not interesting enough to hold anyone’s attention for long. However, there is no doubt that the longevity of this game is quite incredible. For all the care and attention that goes into modern online slot game design, it turns out that all you need is a whopping great jackpot and the players will keep on coming. Too many Arabian themed games! However, Arabian Nights is a nice one from NetEnt. The bonus rounds are good and it doesn’t cost too much to play since there are just 10 paylines that are used. LOVED IT. The jackpot never goes below half a million in my experience. The gameplay and the graphics are super amazing. There are free spins and a lot more features to increase your chances of winning the coveted jackpot.